It has been one of those weeks, and today I needed a pick-me-up. Alcohol I hear you say, of course, but not as you may think, not a drink but as an ingredient to this wonderful dish. I have had my competence, skill and experience brought into question! I will not go into the full details, but it is suffice to say that until you come and experience my cooking, classes and kitchen, you do not have any right to make judgement. So you will see why I needed a bit of a boost, and for me that of course revolves around cooking and recipes. I had the great pleasure of meeting two sisters in 2013 when they attended one of my cooking courses, and during one of the cooking sessions we discussed a movie that they had watched and enjoyed. Julie and Julia, the story of Julia Child, played by Meryl Streep. I had not had the pleasure, but was assured it was well worth a watch. One day after they had returned home I received a package and it was the DVD of Julie & Julia. So today, I decided I needed to watch this movie again. It was just what I needed to restore my usual good mood. I thoroughly enjoyed the movie, great for day that was grey outside and matched my mood, but is now a lot brighter. The movie is based on fact and is a great insight into the life of Julia Child and Julie Powell, but of course the real story is the recipes and the main one is Boeuf Bourguignon, and for me this is a fantastic dish, a wonderful rich, comforting stew, with deep flavours and ideal for this time of year. 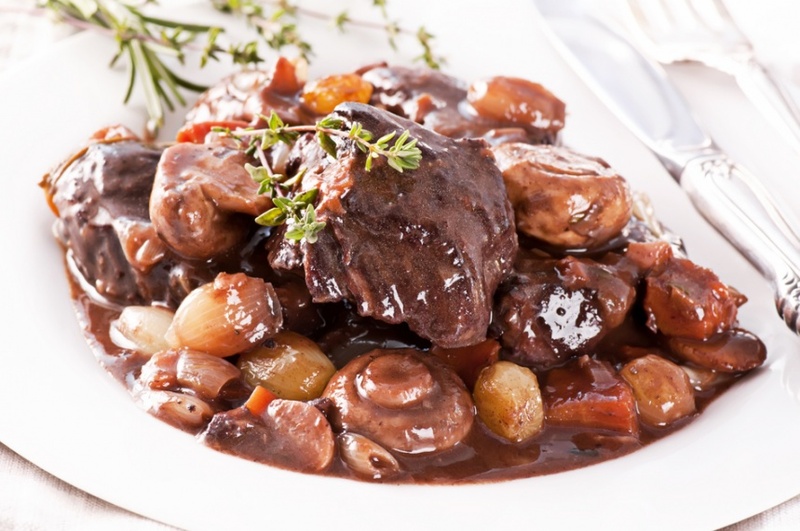 Boeuf Bourguignon is one of the recipes we enjoy at TheSecretGarden-France, a classic french dish, best served with potatoes, wonderful buttery mash or creme fraiche mash, just ad that ‘little’ something to the dish. Preheat oven to 180 c. Pat meat dry. Season all over with salt and pepper. Heat 2 tablespoons olive oil in large heavy bottom pot with lid over medium-high heat. Working in batches, fry the beef with only one layer at a time. Brown on all sides. Transfer to a bowl and continue until all the beef is cooked. When you have cooked all the beef, and removed to a bowl, add the cognac and deglaze pan over medium-high heat, scraping up bits. Allow to reduce by half. Pour the cognac over the beef in the bowl. Add 2 tablespoons olive oil to the pan and add the coarsely chopped carrots, onion and garlic and sauté for 3 minutes over medium heat. Add the beef with cognac, wine, stock, tomato paste and thyme. Mix well, the contents of your pot should be covered, if not, add more wine or stock to cover. Bring to a boil, reduce heat to low and cover and place in oven. Cook until meat is very tender, 2 1/2 -3 hours. After cooking for 2 hours, add the remaining carrots in 1/2″ slices, pearl onions and mushrooms to the pan replace the cover and return to the oven. Cook for 30 minutes to 1 hour. When ready to serve, check the ‘sauce’ for thickness, if you need to thicken the sauce, add 3 tbsp of cornflour to a cup and add 4 tbsp of cold water and mix well, with the pan on a medium/high heat, gradually add the cornflour mix until you have the required consistency. Season to taste with salt and pepper. Note : Beef Bourguignon may be prepared up to two days in advance. Cover and refrigerate. Reheat over medium-low heat on stovetop or in a 180c. oven.